This article was last updated on the May 12, 2018. A common issue with Font Awesome icons missing is due to the domain being requested outside the domain of which the resource originated. Which means we need to enable something called "CORS" To quote Wikipedia. Cross-origin resource sharing (CORS) is a mechanism that allows restricted resources (e.g. fonts) on a web page to be requested from another domain outside the domain from which the resource originated. Enabling CORS is a relatively simple straightforward. Below, we'll cover how to enable CORS on Apache, Nginx & Microsoft IIS, first though, we'll cover how to find out what technology your site is running on if you don't already know. You can find out what type of tech your site is utilizing, by using the great tools over at Netcraft, Click here to visit netcraft. Once you're on the site report page, you should see a box where you can enter a URL like this. For example, go ahead and type in http://wordpress.org and scroll down to the "hosting section", we'll see that WordPress.org is using Nginx. Go ahead and enter your domain/URL to find out what you're using. Got it? Excellent! Follow on below, not sure still what type you're using. No worries, we'd recommend contacting your host and they can let you know. 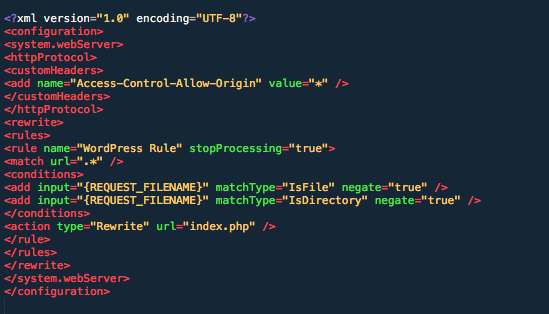 In this section, we'll cover enabling CORS on apache, this article will cover the .htaccess method, rather than the httpd.conf method, both worth perfectly fine and neither one is better than the other. Just different. Without further ado, open up your .htaccess file. You can access your .htaccess file either via FTP or your cPanel's file manager. Once you've got it open, right now it should look something like this. The above image is the default WordPress .htaccess for a single site install, installed in the root of a domain. Your one may look different depending on a few factors, which are. Which version of WordPress you originally started with, i.e, if you started your site on WordPress 3.4 or below with a multisite install, you'd have a different .htaccess than the current multisite install. If you've installed WordPress in a directory other than the root path, for example, /public_html/mycoolsite, rather than just /public_html. 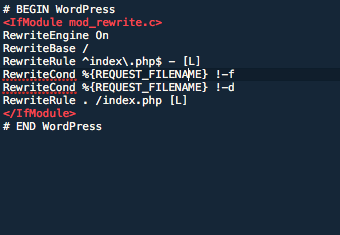 You can find examples of most types of "default" WordPress .htaccess files here. Once you've done that, you should have a .htaccess that looks similar to this. Save that and you're done! CORS is now enabled and your icons should be showing, congrats! The above image is for an IIS 7.0 web.config using a WordPress single site install and pretty permalinks. You can see the default web.config on the WordPress.org site here as well. Save that and you should now be good to go. Congrats! Before we continue, you should have a basic understanding of Nginx configuration and server blocks. If you have any issues adding the code or don't know where to add the code, we'd recommend contacting your host for assistance. If you don't have direct access to your server you may also need assistance from your host. So open up the file where you want to add cors support or create the file as explained above and enter the following code. The most common cause of receiving a 404 for Font Awesome is on a Microsoft IIS web server, IIS doesn't enable the .woff or .woff2 mime type by default, so we'll need to add some additional rules to the web.config for this. Save that and the Font Awesome should be working now. Note: If Font Awesome still isn't working, icons aren't showing still etc, please clear your browser cache and any caching plugins you have installed, if they still aren't showing, open up a support request here and our awesome support team will be right along to assist! How to reset location of font awesome webfonts? Missing Icons in Cornerstone -Back end and Front end! All icons and bullets looks the same - Need help!